TIMAC AGRO has been improved the performance of the Fruit, Vegetable and Industrial crops sectors thanks to its ATCs skills. They are the ones who are close to the farmers, who are aware of the reality on the field and playing a key role. 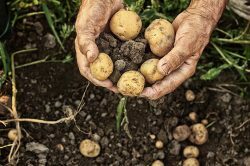 By offering the best solutions, they are helping them to produce better, and crop after crop they are promoting the reputation of TIMAC AGRO’s solutions with each invested sector. These efforts can be rewarded with a contract agreement with major industrial players, as our teams succeeded to do in Italy and Poland. – Plants: for vegetable plant propagation.